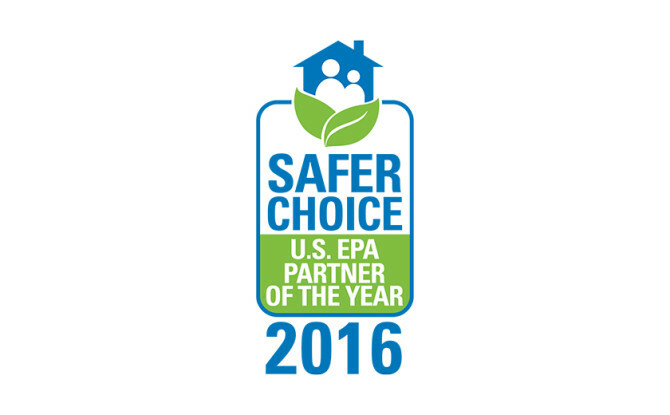 We’re thrilled to announce that we’ve been named a 2016 Safer Choice Partner of the Year by the Environmental Protection Agency (EPA). The EPA gives this award each year for advancing the goal of chemical safety through exemplary participation in or promotion of Safer Choice, which helps consumers, businesses and purchasers find products that perform well and are safer for human health and the environment. HSC was recognized in the supporter category for our work advocating for and educating users on the EPA’s Safer Choice third-party certification for cleaning products. The label indicates that every ingredient in the product has been through an EPA review. Along with Green Seal’s GS-37 Standard and UL Environment’s ECOLOGO®, it’s one of three third-party certifications we recommend on greencleanschools.org. Third party certifications from respected third parties can help school facility directors navigate the marketplace and weed out products that simply claim to be green. With our three recommendations of third-party certifications, we try to take the guesswork out of choosing products, so facility managers can focus on the important things—like making sure schools are as clean and healthy as they can be. Our partners, the Ashkin Group and ISSA, The Worldwide Cleaning Industry Association, are also listed in the Supporter category this year. The awards were presented at a ceremony in Washington, D.C. on May 9.